Although Mexico had prospered under the thirty-four-year dictatorship of Porfiro Diaz, social tensions were bubbling below the surface, leading to the Mexican Revolution (1910-1920). When Francisco Madero organized a revolution in November 1910, his middle-class supporters were crushed by Diaz’s ruthless intelligence apparatus but the uprising unleashed powerful social forces. In the northern states of Chihuahua and Coahuila, Pascal Orozco and Pancho Villa led a revolt by villagers tired of the iron grip of the Terrazas faction of oligarchs. Rebellion had broken out in the southern states as well, and one of the more effective leaders was a village chief in Morelos named Emiliano Zapata. Faced with rebellions in eighteen states, Diaz resigned on May 25, 1911, and fled the country. Madero shocked his supporters by refusing to purge the government of Diaz loyalists. An idealist, Madero hoped to win over the army and the elite, but they conspired with Generals Bernardo Reyes and Felix Diaz, the dictator’s nephew, to launch a coup in February 1913. Madero mistakenly placed his trust in General Victoriano Huerta, who switched sides, deposed Madero, and then betrayed Diaz by making himself president. News of Madero’s murder led Villa to return to guerrilla warfare against Huerta. Zapata had never actually stopped fighting since Madero had refused to approve large-scale land reform, but Huerta was confident he could handle both of them. To his surprise, he received little support from the rich. Members of the elite had supported Diaz and Reyes to get their privileged positions back but Huerta believed that Mexico existed to support the army, and refused to even pretend to believe in democracy. The situation worsened when Venustio Carranza, governor of Coahuila, assumed leadership of the revolution. Despite Huerta’s contempt, Villa had built up a professional army, while Zapata had become a skilled guerrilla, who organized rebellions in several states. Huerta should have realized that his time was up when the Americans occupied Vera Cruz to avenge a minor diplomatic insult, and none of his opponents heeded his call to unite against the foreigners. Huerta would have been overthrown sooner but Carranza resented Villa’s insistence on autonomy, and gave more resources to Alvaro Obregon, a more loyal general. Huerta resigned on July 15, 1914 and fled to exile in Barcelona, Spain. Carranza thought that he was the natural choice for president, but Villa and Zapata had the two largest armies in Mexico, and they both detested Carranza. The revolution was far from over, and would become even bloodier. An arms dealer named Kennedy (Zachary Scott) and his wife arrive in Mexico where they receive a warm reception from the government. Unknown to Kennedy, Wilson (Mitchum) a rival arms dealer is following him. Wilson makes contact with a group of rebels led by Colonel Jose Escobar (Gilbert Roland), and convinces a suspicious Escobar to help him steal a cache of arms and ammunition from Kennedy before it can be delivered to the Mexican government. Wilson’s scheme becomes complicated when he falls for Lisa, Kennedy’s wife (Ursula Thiess). The script’s explanation of the historical situation in Mexico consists of a single phrase: “In 1916, war swept across Mexico.” A more precise statement would be: war swept across Mexico from 1910 to 1920. Francisco Madero had led a revolution against the dictator Porfiro Diaz in November 1910 and Diaz fled into exile in May 1911. 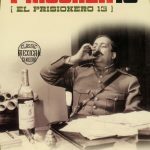 Madero failed to satisfy the demands of his followers, and they rebelled under the leadership of Pascual Orozco, a hero of the revolution, in March 1912. The rebellion had been crushed by General Victoriano Huerta with the assistance of former guerrilla Pancho Villa by the fall of 1912, but Huerta overthrew Madero in a coup in February 1913. Huerta’s regime lasted a little over a year before he was forced into exile by armies led by Villa, Emiliano Zapata and Alvaro Obregon. Following several months of political maneuvering, civil war broke out between Venustiano Carranza, supported by Obregon, and a rough alliance between Zapata and Villa. After a series of battles, Obregon had destroyed much of Villa’s army by the summer of 1915, and Villa had returned to guerrilla warfare. Although Zapata would hold out in his stronghold of Morelos for another year, Carranza was recognized as president of Mexico by the United States on October 19, 1915. Hoping to provoke an American intervention, Villa raided Columbus, New Mexico on March 9, 1916, which led to a Punitive Expedition commanded by General John Pershing that remained in Mexico for almost a year without finding Villa. While it is set during the Mexican Revolution, there is literally no attention paid to the revolution, and there is no mention of a single leader on either side. Instead, guerrillas armed only with rifles struggle against uniformed federal troops equipped with machine guns and artillery. This lack of historical context is a missed opportunity since the movie was filmed on many actual battlegrounds, including the place where Zapata was assassinated, while many of the extras had even fought in the revolution. However, the film does show the rebels’ desperate need for ammunition. Lacking a steady supply, both Villa and Zapata’s guerrillas were forced far too many times to end a battle early because they had run out of bullets. The rebels had to smuggle ammunition across the border but the government controlled the ports, and received a regular flow of ammunition, which was a vital factor in Carranza’s eventual victory. Screenwriter Earl Felton was prolific but had produced few notable scripts. Good friends with Mitchum, Fenton wrote a script about a movie company in Mexico in 1916 and an American mercenary who was Villa’s right-hand man to satisfy Mitchum’s desire to play a solider of fortune. 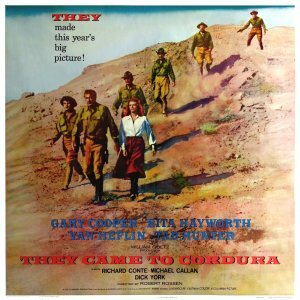 Impressed by the script, both Mitchum and director Richard Fleischer signed on to make the picture. After going to Mexico to look for locations, the two men returned to the United States where they were presented with a new version of the script that had no humor, no movie company and no Villa. Initially refusing to have anything to do with script, the threat of a lawsuit from United Artists persuaded Fleischer to direct the film, and he dragged Felton to Mexico to rewrite the script during the shooting. Felton was literally producing pages immediately before a scene would be filmed. As a result, the story does not really make sense, while key characters always end up in the right place at the right time, even if they were supposed to be somewhere else and should not have known where the other characters were. Despite the complete absence of any historical detail, it is an enjoyable movie. The early scenes in particular are a joy to watch, until the story starts to bog down in a morass of confusion. Mitchum radiates cool, walking towards a battle with his suitcase, stopping to pick up a bottle of alcohol from an abandoned bar. He calmly sips his drink on a balcony overlooking the fighting before tossing grenades at the federals, thus turning the tide of the battle. Everyone else in the film jumps off a moving train but Mitchum steps nonchalantly off the train. Many, many bottles of liquor are drunk during the movie. These scenes portray Wilson as an idealized version of Robert Mitchum, which reflects the fact that he was a producer, and Felton had written the script with Mitchum’s uncredited assistance, usually in a bar, so the scenes were intended to show him as he saw himself. The film has an abundance of gorgeous scenery, unsurprising since it was filmed in the area around Acapulco. Max Steiner’s jarring score is a holdover from an earlier era of Hollywood, and completely warps the tone of the movie. Aside from the script issues, the filming was far from smooth. Two of Mitchum’s drinking companions had to be flown out at night because their lives were in danger after too much carousing and trouble-making. Mitchum’s stand-in Tim Wallace had knocked out the mistress of a high-ranking Mexican policeman during a brawl, and his makeup man was so rude to the locals that the crew stole the negative, refusing to return it until he was sent home. The studio even had to pay out $10,000 to prevent Mitchum from being tossed in jail on trumped up charges of possessing marijuana. Filmed before computer-generated battle scenes, the first-aid station treated an endless line of bruised and bloody stuntmen, along with the ‘turistas’ that kept most of the American cast and crew in the toilet or vomiting behind a brush. 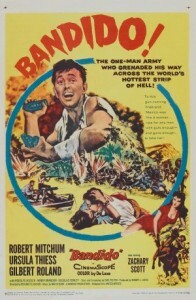 Mitchum performed most of his stunts, aside from an early scene in a Model T that was driven across a very rocky road. Mitchum decided to have his stand-in take the spine-punishing ride. 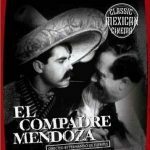 Although set during the Mexican Revolution, the film has almost zero historical context but is an entertaining story about rival American arms dealers.